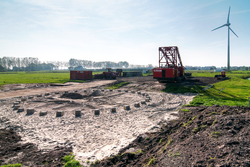 Alongside the Kanaaldijk in Alkmaar, foundation piles have been applied for a windmill foundation. 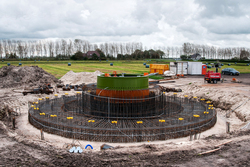 The windmill will be the second for windmill park Liefting and is situated in sight of the already present mill. 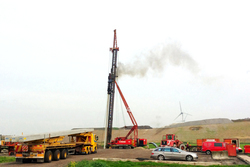 In 2015, the windmill will be completed and in service. 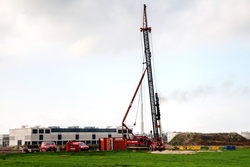 With the new windmills, there will be a total of three in Alkmaar. 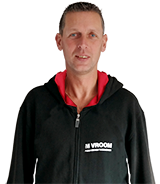 For the time being, there is a total of four windmills in Alkmaar producing a total of around 10 MW which is enough for around 7000 households. 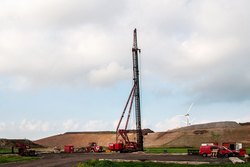 Perhaps in the future, more windmills will be built. 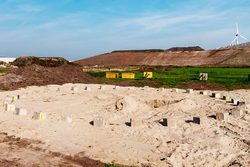 Sortiva, a joint daughter company of HVC and GP Groot in the recycling sector, is responsible for the funding and the exploitation of the windmills. Sortiva makes sure that waste is turned into raw materials and energy. 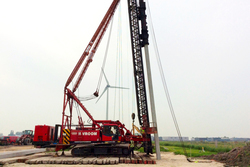 Underneath each windmill, 32 prefab CFA piles with a maximum length of 23,5 m will be applied. 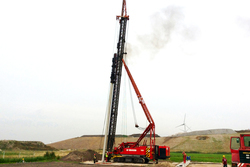 The piles are square with a diameter of 400x400 mm. 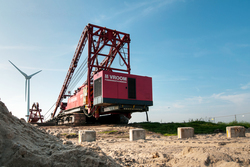 As the mills have to be able to resist heavy storms, the piles underneath the mills will be inserted in a slant position. 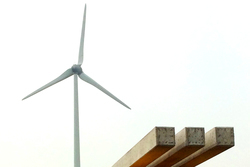 The slant position for these windmills is 11:1. 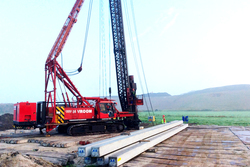 In the event of a heavy storm, there will be enormous pressure on the foundation piles, compressive as well as tensile stress. 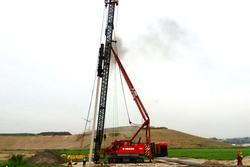 The piles can stand this pressure well, however, it is necessary that the piles are being inserted on the right place. 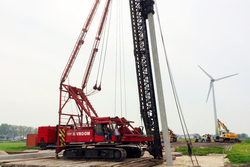 Vroom Dimensioning Service will take care of the piles’ exact dimensioning process. 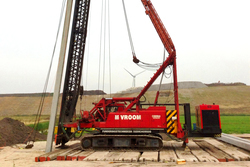 Moreover, the height as well as the horizontal position are being checked.